The gym officially opened July 8, 1951. The Sunday afternoon celebration, attended by 1,500 people, featured speeches followed by an evening celebration with another 1,500 people in attendance to hear the Luther Choir and the RCMP Band. The choral tradition at Luther began in 1914. In addition to in-school performances, the choir has shared its ministry of music with many congregations across Canada and has performed regularly on local and national radio and television shows, at contests and festivals. The first LIT was held on January 31, 1953. That year it was a one-day tournament involving sixteen teams from Southern Saskatchewan. All preliminary games were played cross court, two games at a time. Luther students, even though from diverse social and cultural backgrounds, have the opportunity to be part of tightly woven community of students, parents, alumni, teachers and staff. Typically 12% of the school’s student body originates from outside of Canada. This week in our new student's blog, we thought we would tell you a little bit about the school's band program. 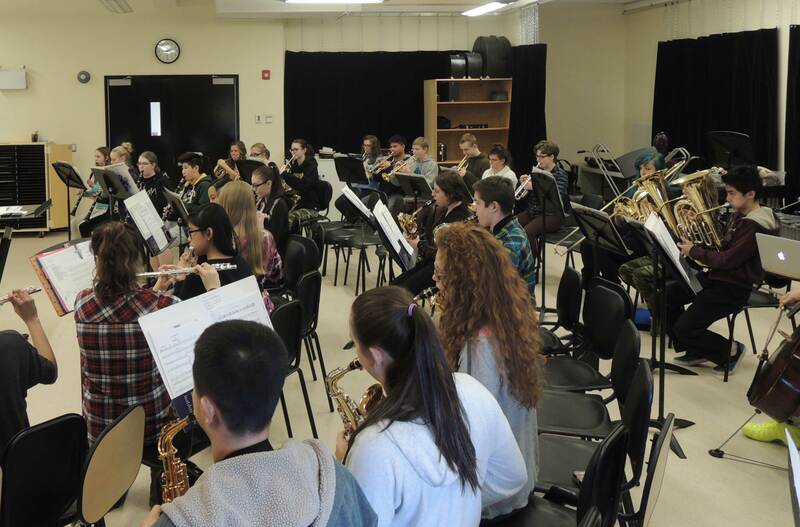 Our band program has been very popular with students this year, and it's not hard to see why! We offer Band for credit from grade 9-12, as well as music, at Luther. The band program includes ensemble band experience, instrumental technique, music appreciation, individual & group performance. In grade 9, music students focus on the basics: listening skills, performance, note literacy skills, and handbells. Music and Choir are twinned at the grade 10-12 levels, with students having the opportunity to receive credit for both. We also offer IB music at the grade 11/12 level, where students study music history (western & world music), develop listening techniques through the study, analysis and examination, comparing & contrasting of musical cultures, and create music through composition, arranging & improvising performance. Our music program includes wonderful music from our choirs -- we have a girls' choir (grades 9 and 10), senior choir (grades 11 and 12), gentlemen's choir (grades 9-12), AVE (advanced vocal ensemble, grades 11 and 12), as well as numerous other options like boys and girls barbershop. The choir program focuses on voice development, ear training, sight reading, basic theory, and an exploration of different styles, from jazz to classical. Right now our choirs and bands are getting ready to tour all over Saskatchewan and the prairie provinces -- the senior choir is even going to Banff! We have amazing facilities for all of our music programming as well, including a new band room, updated performance spaces, practice spaces, and equipment. Band and music are both very popular programs at Luther so we encourage you to sign up if you are interested because spaces are filling fast! If you have any questions, feel free to contact our new student coordinator at julia.mitchell@luthercollege.edu.